My sister pointed out the movie Blackfish to me recently. I have no idea why I had not heard of it before but I am so glad I know about it now. And so should you. 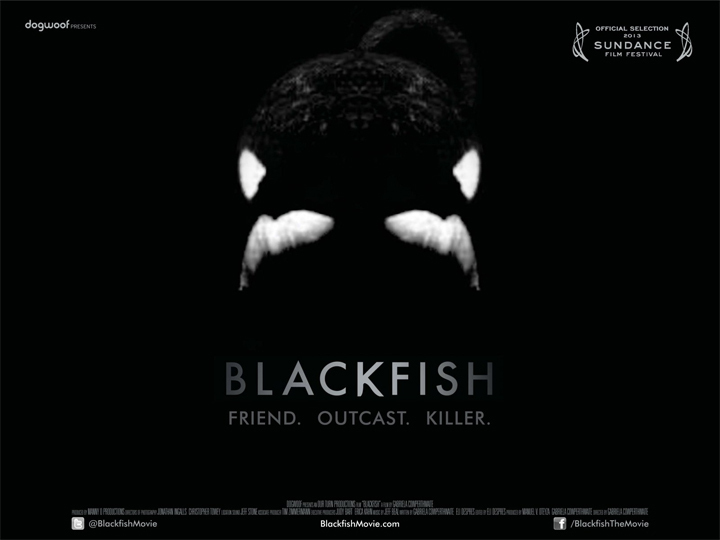 This documentary talks about Orcas (Orcinus orca) and how cruel it is to keep them in captivity. Now, you may feel compelled to stop reading here as you may be thinking to yourself, not another story about the cruelty of animals in captivity. Well here is why you should listen. Orcas are incredibly social animals. They grow up in family pods. Now imagine being kidnapped (let’s face it, that’s what it is) away from your family and being thrown into a small concrete pool with four others of “your kind” — to be explained further later — and be expected to get along. Fights and altercations are common among captive Orcas, and it is understandable, these particular individuals would never be together in the wild, so why would they get along when they are forced to be together in captivity. In a recent BBC article about Orcas, I read that scientists have discovered that the species we call Orca is made up of at least ten different ecotypes (Orca populations that hunt in very different and specific ways) of which four are genetically distinct and all of them have not interbred for over 200,000 years (that’s longer than humans have been around). This basically translates to there being more than one species of Orca. Now in captivity, Orcas from both the Atlantic and the Pacific share enclosures (and are artificially bred together). It makes total sense to me that these incredibly smart animals have a reason not to get along. Of course that doesn’t matter to us people as long as they perform their show duties…. Dolphins, of which Orcas are the biggest member, are incredibly emotional animals. In fact, the parts of the brain responsible for emotions is much larger in them, than us humans, meaning dolphins have a greater ability to feel emotion than us. (You can read one writer’s views on the dolphin brain and how it relates to captivity here). Now imagine that you are back in your concrete enclosure, starving because you have not gotten food (tricks are encouraged through food deprivation), are forced to live with others you don’t get along with, and have the emotional wherewithal to feel everything. Orcas lashing out at their human trainers, though of course awful in all aspects, is understandable. I do believe that these marine mammals know what they are doing and if they are attacking the trainer, they are doing so by choice. Now one thing I would like to stress is that it does appear that the trainers care more about the animals and their well being than anyone else and this is by no way an attack on them. The film maker, Gabriela Cowperthwaite, agrees (you can watch an interview with Gabriela here). So, how can we prevent these magnificent animals from being in captivity in the future? The answer is very simply, don’t go to the parks that keep Orcas in captivity! There are a few points that are important to make. The animals currently in captivity can probably not be freed — growing up in their concrete environment, especially without a true family pod, would probably not survive in the wild. These animals should be cared for until their deaths, but the breeding program employed at the parks should be completely halted. If you don’t spend your money at the park, they will have to realize that there is no long term future for them and their Orca shows. Now, I know that me telling you not to go to a park is not really fair. I am telling you to not do something but I am also not giving you a solution. Well, here is the solution. Let’s say you are in San Diego and you were thinking of attending the park with your family but feel ethically weird about it. What else could you do? Did you know San Diego has some of the best wild dolphin and whale watching in the world! And guess what, its cheaper than going to the park — check out San Diego Whale Watching. San Antonio has great birdwatching. Check out the local Audubon society’s website. For Orlando, there is great birdwatching at Merritt Island National Wildlife Refuge. Do you have a wildlife activity you would recommend somewhere near the parks? If so let us know! If you do visit a park housing Orcas and other dolphins, please take a moment to closely observe their behavior and you will see that they are not normal and often show signs of mental problems. These animals simply do not belong in captivity. I hope you agree. Update: California Assemblyman Richard Bloom introduced a new bill, the Orca Welfare and Safety Act (AB 2140) that would ban the captivity of Orcas for entertainment of performance purposes. If you feel as strongly about this matter as I do, please sign the bill here.